If you are designing a t-shirt or sweatshirt graphic it can be a huge help not only to you but also the client to see where that design will be placed. This free t-shirt and sweatshirt illustrator template can really save you a lot of time and headache. Using these templates is also very helpful and necessary when you send finalized graphics to be printed. This file includes front and backs for short sleeve t-shirts, long sleeve t-shirts, and hooded sweatshirts. Now just use some of your creative juices and my free graphics to start laying out your very own shirt designs. Enjoy, it has Ben Blogged! Thanks dude!! You are awesome!! Thanks a lot! really useful! This is very helpful. Much, much appreciated. Very cool and very handy. Thanks! very good and very useful! Thankssssss!! Again, your work is awesome. cheers! this rocks! what a time saver. thanks for sharing. This was a lifesaver, thank you so much!!! Thanks homie! 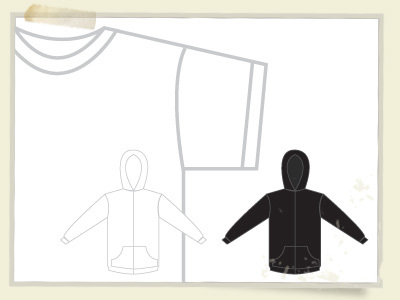 You have just enabled me to produce my first sweatshirt linesheet! See you at the top homie! Thanks for the lineart… was exactly what I was looking for! Thanks for the templates! Awesome. Thanks for the templates! These came in handy! Thanks so much, you’re an angel! Thanks for “paying it forward” with your kindness of allowing others to have access to your t-shirt and sweatshirt templates. This has saved me a few hours work preparing files for a promotional project. Thanks! This template is exactly what I was looking for. Cool. Thanks. I was looking for a black one. Thanks broseph, these are awesome! Hey, thanks so much for this!